Four berths with sitting headroom. Comfort version. The cabin consists of two saloon berths (6' 7" long) with stowage beneath either side of a removable table. 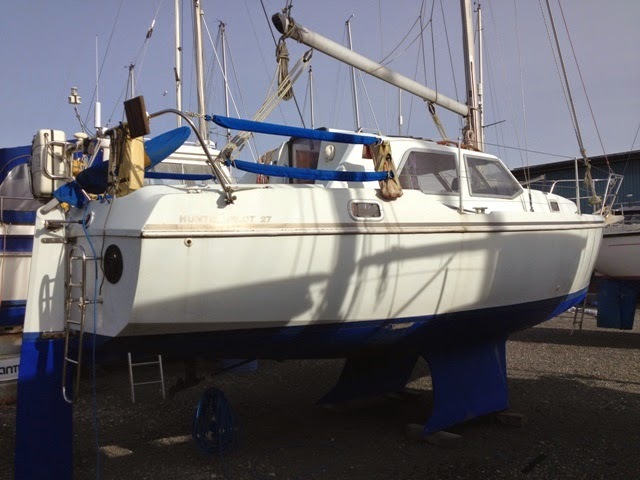 Forward are two galley areas to port and starboard fitted with a sink with manually pumped water supply and water tank with removable single burner gas cooker opposite. The forepeak has a double berth (6' 3" long) with space for a chemical toilet and storage beneath. 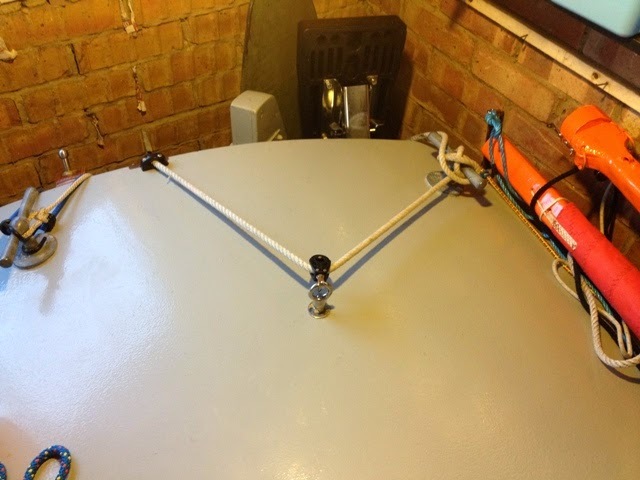 Light and ventilation are provided by a circular fore hatch, two opening portlights and two adjustable spotlights. Teak fit out with teak veneer sole boards, green velour upholstery and light vinyl fabric hull linings throughout. Jeanneau Sun 2000 Comfort built by Jeanneau, France in 2002. Green GRP hull (professionally resprayed in August 2014) with style stripes. Self draining cockpit. Port and starboard cockit lockers. 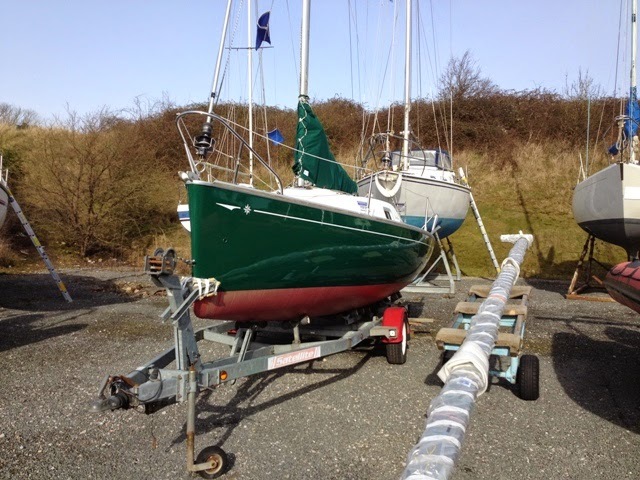 Tiller steering to removable and lifting rudder (new frame and bushes 2014). Bow roller. Self draining anchor locker. Aluminium and teak toe rails. 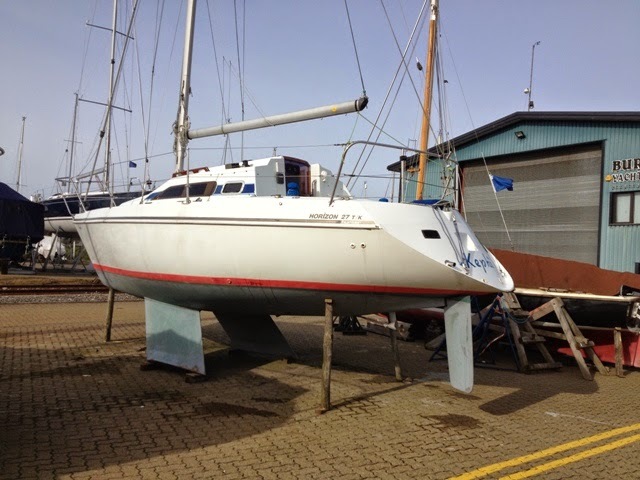 Lifting GRP keel with Spinlock clutch in cockpit. She’ll have a lively performance, and she’ll be a good club racer. 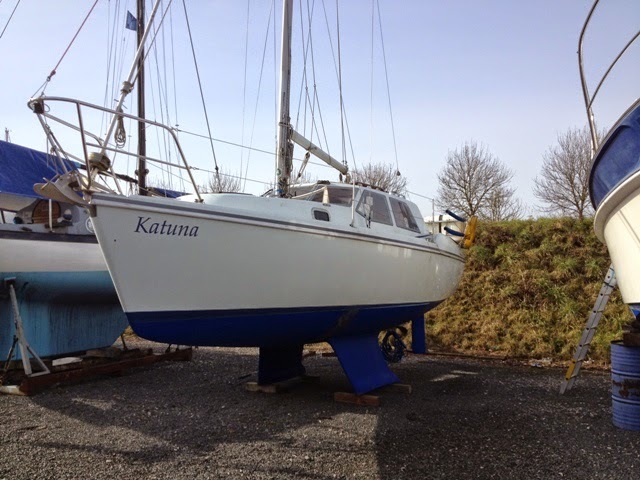 With a crew of two, who know what they are doing, she’ll be great for coastal cruising. 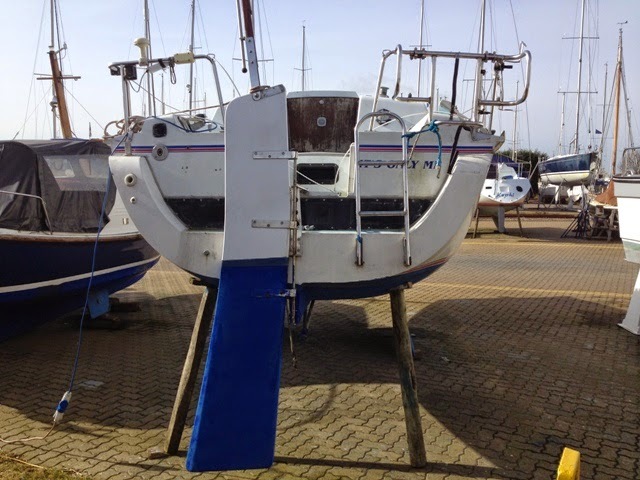 Upkeep will be minimal, and if she is kept at home, the expense of mooring her in a marina can be avoided. On 11th October, 2010 I posted an article* featuring the Hunter Pilot 27 and I could only find praise for her. I am still of the same opinion, and I have added new photos of a Pilot 27 here. 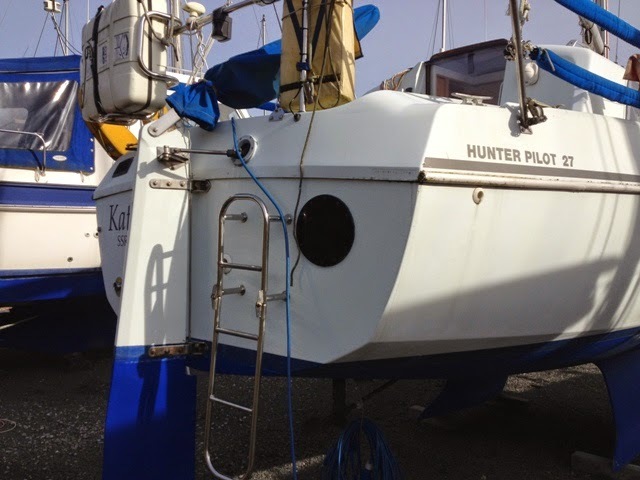 There are a lot of similarities between the Hunter Horizon 27 and the Pilot 27, but the latter has the advantage of dual steering - from within the cabin or from the cockpit. She also has more headroom all-round, which is particularly useful in the aft cabin, as the Horizon 27’s is minimal to say the least - some may describe the enclosure as claustrophobic. The Horizon 27 has a double berth in the forepeak with under bunk storage. In the saloon there are comfortable settee berths to port and starboard of a permanently fixed fold-down table. On the port hand side next to the companionway there’s a heads compartment. Forward of this there’s a navigation table. Opposite on the starboard side there’s a galley with a single stainless steel sink, ice box and a cooker with an oven and grill. The aft cabin houses a cramped double berth with access to it on the starboard side. At 26’ 10” LOA the Gib’Sea 76 is 10” longer than her less attractive predecessor, the Gib’Sea 77. I say less attractive in an aesthetic sense, because the unique smoked Perspex ‘wrap-around’ windows of the 76 look to me much prettier and more functional than the standard semi-pointed side windows of the 77. Another advantage of the longer boat is that she has the added privacy of a well-illuminated aft cabin. Take note of the long rectilinear window built into the transom for providing light in the aft cabin. There are more ports for this cabin either side of the companionway that are not visible in my photos. She has a removable washboard in the transom that gives easy access to a fold-down stainless steel boarding ladder. The Gib’Sea 76 was in production between 1984 and 1990. She was designed by Groupe Graal for boat manufactures Gilbert Marine. 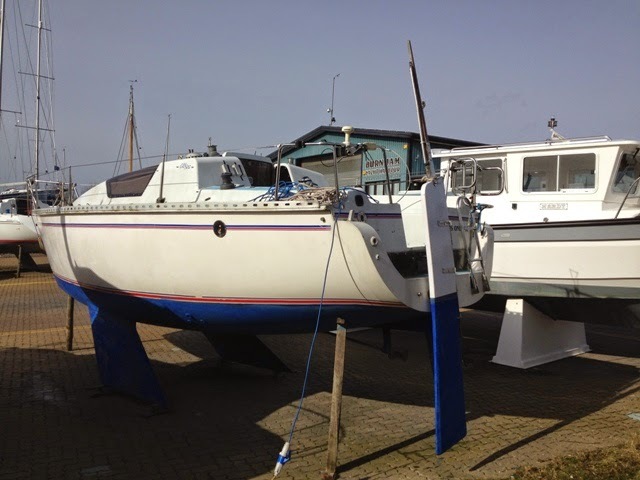 Prospective purchasers could choose between buying one with a fin keel, drop keel, or with twin keels. 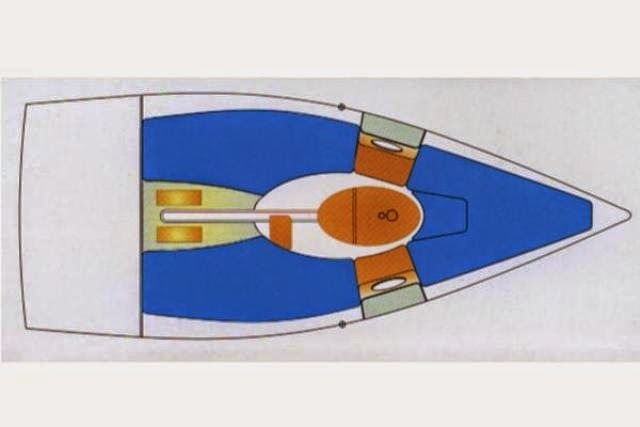 The drop keel version had a draught of only 2’ 7” when fully raised, but for clearance at that depth, her rudder had also to be raised to the maximum setting. Quite a lot of thought went into the functional aspects of the boat; for example, notice the neat shaping of the starboard pushpit for mounting a lifebuoy, and the full length alloy toe rails for keeping the crew safe when doing deck work. 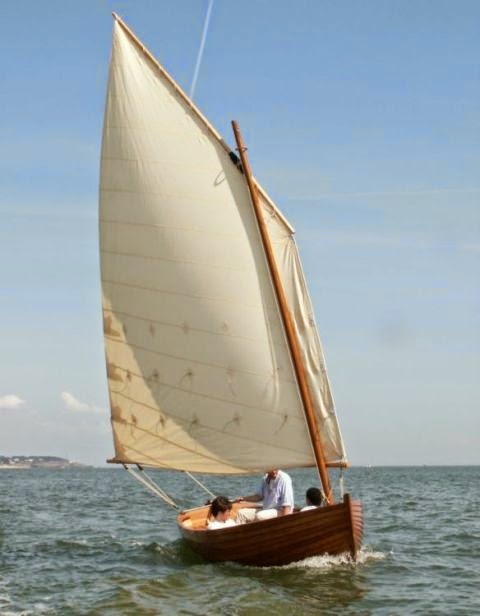 Although not shown in my photographs of ‘It’s Only Me’, she is fitted with a furling Genoa. Her two-bladed folding prop and shaft are supported by a ‘P’ bracket. She is most probably powered by a Volvo Penta 9 HP diesel engine mounted in a soundproofed compartment. Not many boats of her size have six berths: a double ‘V’ up forward, two settee berths in the main cabin, and a large double in the aft cabin. 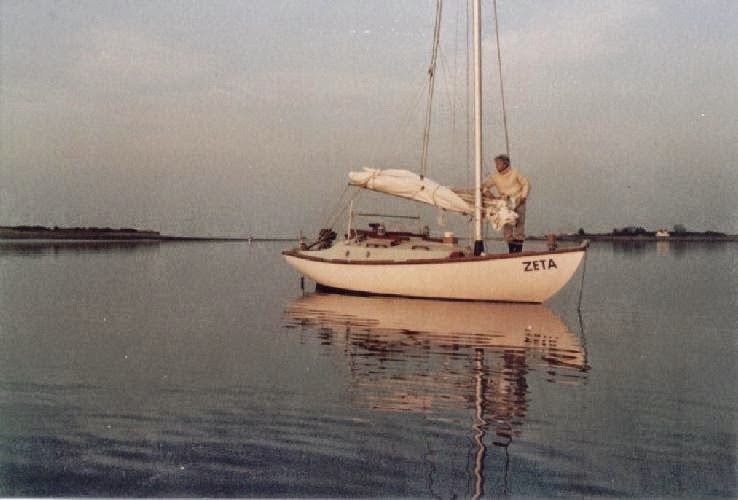 Her lines indicate that she has a good turn of speed, and if her interior is identical to the one illustrated by photos in the archives* of Yachtsnet. co. uk she is indeed a comfortable boat. 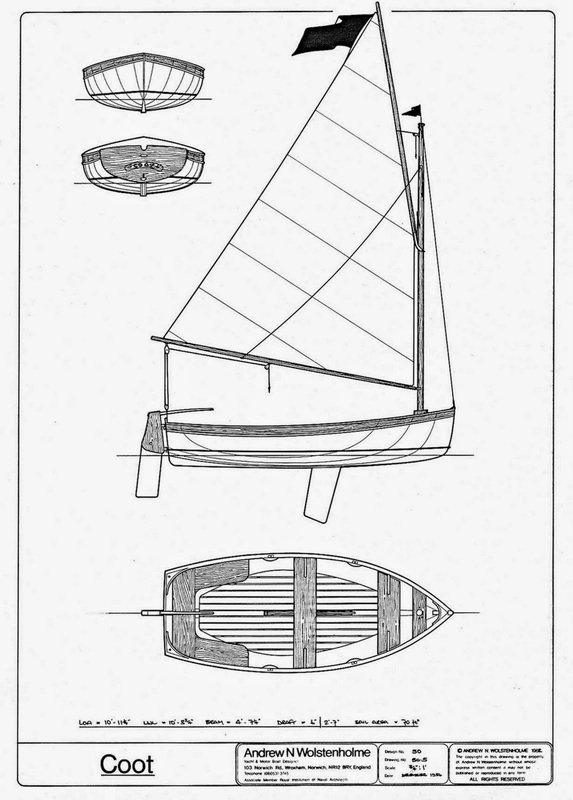 Here’s a short introduction to François Vivier, a very experienced and respected French naval architect who has designed numerous sailing boats, many of them suitable for building by amateurs. 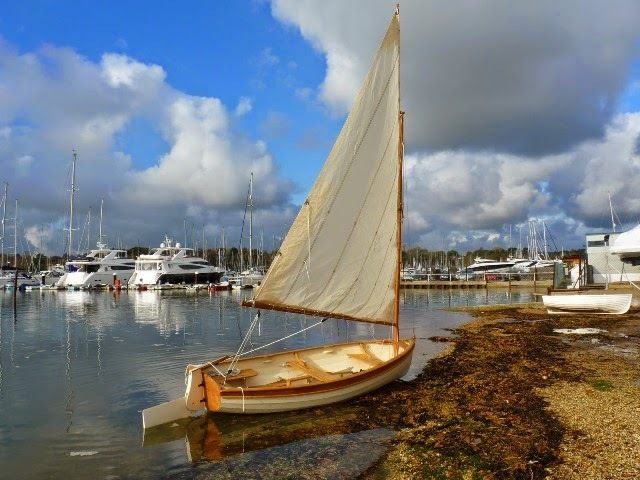 His designs range from the smallest pram dinghy to the 17.2 metre Quimper. 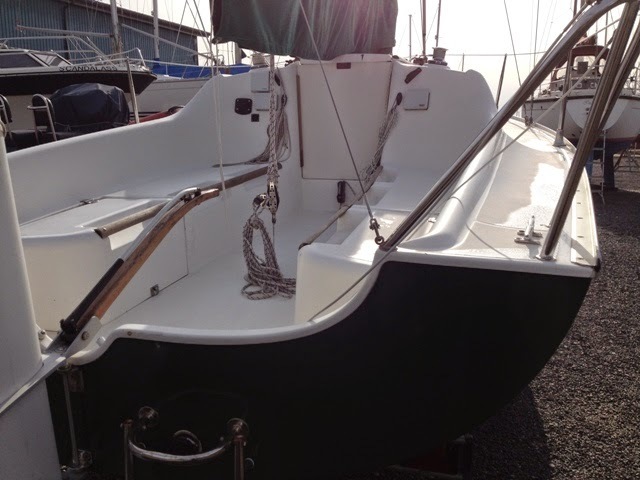 She is based on the lines of a traditional mid-19th century lugsail coastal trader. His Ilur* is perhaps his most well-known design. Over a thousand plans have been sold. 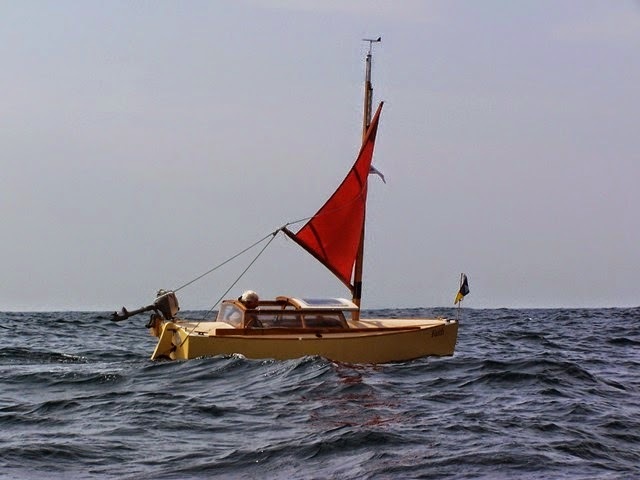 She’s a traditional styled open boat propelled by a loose-footed lugsail and with oars. There’s an option to have her rigged with a balanced lugsail, but I’m not so keen on this, on account of the boom. The clinker version can be obtained in the form of a NC cut plywood kit. My favourite Vivier design is his Méaban**. 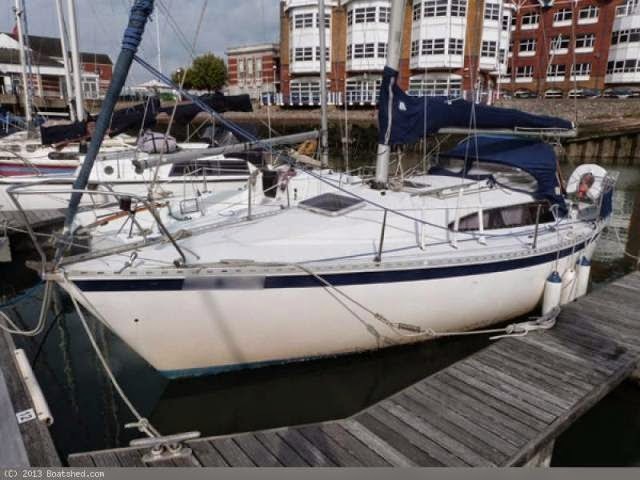 She’s a 6.8 metre cruising yacht with a centreboard that does not intrude into the cabin. Good use is made of her interior by having two berths, a small galley, several lockers, a sliding chart table, a folding table for when at anchor or in harbour, and a toilet in the forepeak. The auxiliary engine comes in the form of a 4 to 6 HP outboard mounted in a well, which is forward of the rudder, but aft of her large cockpit. 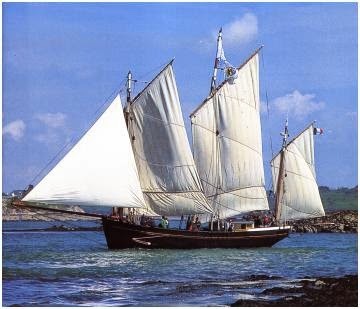 She can be rigged as a gaff sloop or Bermudan sloop. 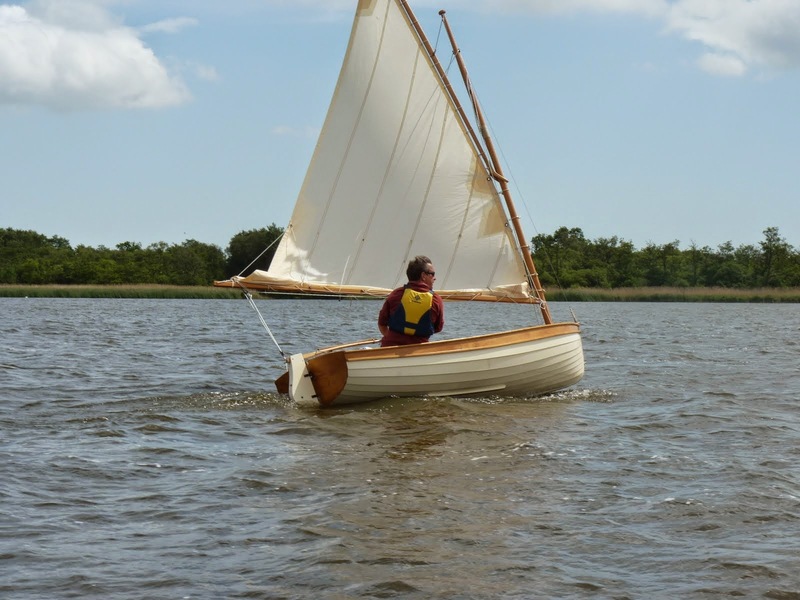 I’m happy to say that readers now have direct access to my articles about Small Sailboats and my Cruising Logs. You’ll see links to them near the top right-hand corner below the header photo. Adding them was a major breakthrough. I’ve tried several times in the past when using Internet Explorer as my operating system, but by resorting temporarily to Google Chrome I’ve been successful. This should enable readers to see many articles posted over several years. I hope they will prove useful and enjoyable. 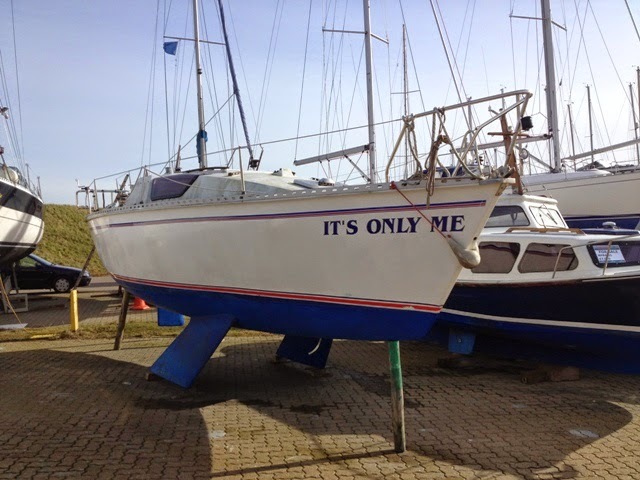 I recently received an email from a sailing friend who said he was about to start a new boat building project. His plan was to first get rid of a collection of bicycles, but to keep the most liked one - the most comfortable and efficient. This will free him to concentrate on his new project, and to make space for undertaking it. No doubt, he will sell his unwanted bicycles to help finance the new project. 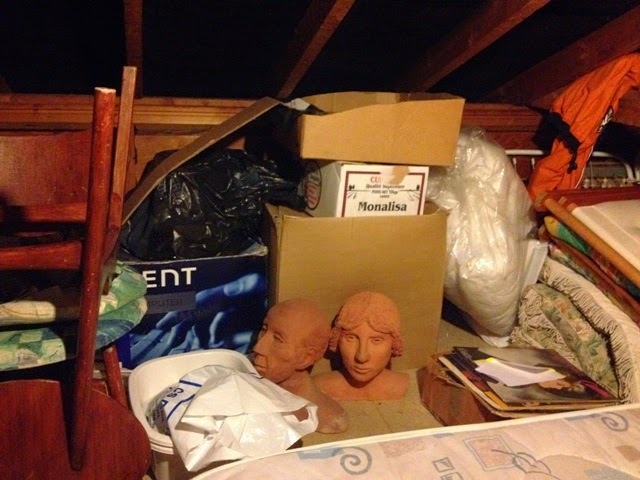 On the same principle of making space, my wife and I periodically sort through bits and pieces that accumulate in our loft. We then get rid of things we think will be of no future use. Likewise, now and again, we rummage through wardrobes and drawers to select clothing we no longer wear, and to donate it to a local charity shop. It is surprising how much junk accumulates over a period of a year. There’s never enough room to put it. Even our garden shed is bung full of stuff! A temporary solution has been to stack surplus items behind the shed and to cover them with tarpaulins. Unfortunately, these particular possessions belong to one of our daughters, and we are holding them in trust until she can find room to store them. 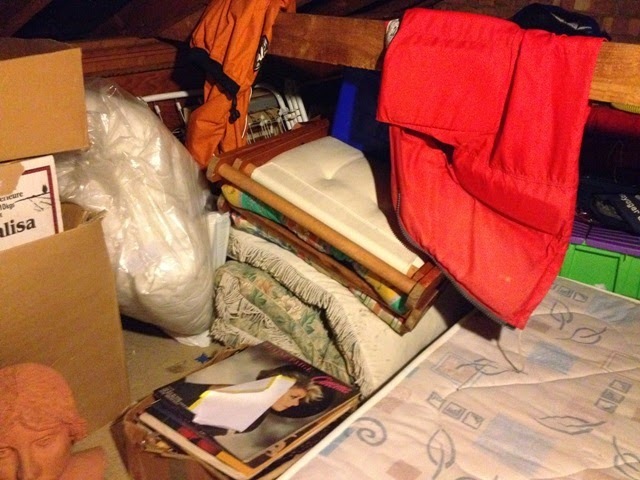 Recently, a different daughter set aside time for sorting out her attic. She found possessions she and her husband had forgotten they owned. The exercise - and I mean exercise – took her many hours. Repeatedly climbing up and down a ladder, plus sorting through the contents of boxes to determine what was worth saving, required much effort, besides effort expended disposing of them. The principle behind reducing ones possessions is that it brings rewards. There is a mistaken belief that the more we own, the richer we are. The truth is, that the less we own, the richer we are! This would appear to be a paradox, but let me explain: Possessions are a hindrance, because they require time, money and effort for maintaining and looking after them. They can be, and often are, a cause of anxiety and grief - especially if we set our heart on them and something untoward happens to them. We then look to the insurance company for compensation, but things that have been irreparably lost are gone for ever; they cannot be replaced, except perhaps by like for like items. Artefacts that have been repaired are never the same. 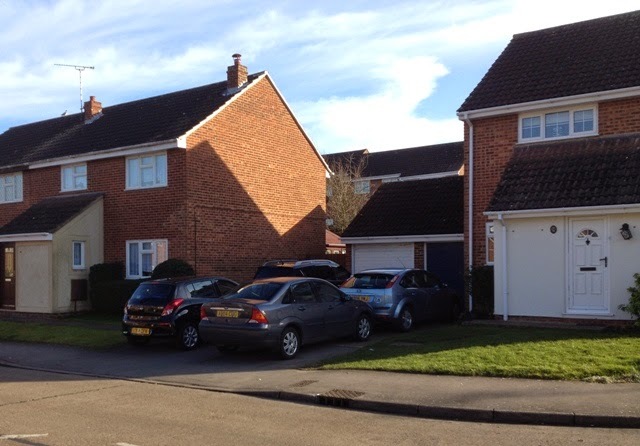 There comes a time in life when it is sensible to shed a number of possessions, even to downsize considerably. We see this with pensioners who are on fixed incomes. They no longer have the means for increasing their possessions, and they see the wisdom of simplifying their lives. This can be a rewarding experience, for it gives them time for doing things they could never have done before. They are no longer burdened with unnecessary possessions, and they are freed of stress and anxiety brought about through ownership. There’s a double bonus if their siblings have left the nest! Specifically, this principle of life is addressed to Christians who experience suffering because of their faith. Today I heard the dreadful news that 21 Egyptian Coptic Christians who had been kidnapped by ISIS militants were brutally murdered on a Libyan beach by being beheaded. In response to this barbaric, evil mass murder, Egyptian war planes with the sanction of President Abdel Fatah al-Sisi attacked ISIS targets in Libya. A spokesman on behalf of the Egyptian Armed Forces General Command stated on state radio that the air strikes were, ‘to avenge the bloodshed and to seek retribution’. Forgiveness by bereaved relatives for such a calculated and deliberate act of mass murder is almost unimaginable. How can these merciless butchers be forgiven for their heinous crimes? The one True God of love and justice will ultimately avenge their deaths. There are many kinds of realities, but the reality that the majority of us readily perceive and understand is the, ‘state of things as they actually exist, as opposed to an idealistic or notional idea of them’. * When we suffer pain we acknowledge the ‘reality’ of that pain. 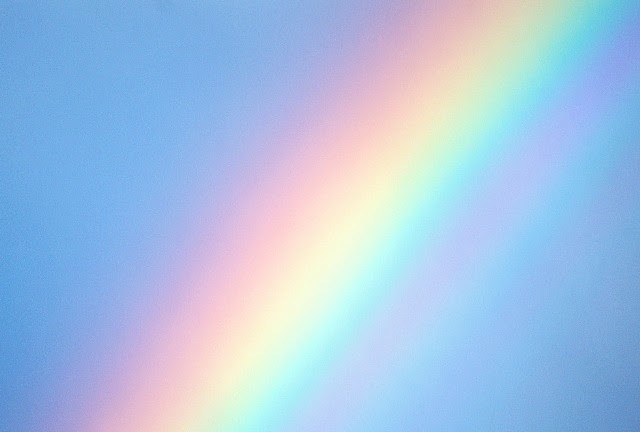 Our experience confirms the truth of our situation, unless we are deluded by some form of psychosis. This observable and often measurable reality is what I call ‘tangible’ reality. We use information from our senses to determine what ‘physical’ reality or ‘material’ reality is for us. The flaw in the argument is that our senses can be deceived, because what we see, touch, smell, taste or hear can be influenced or distorted by contextual circumstances. For example, we all know that adjacent, but opposite colours of the spectrum emphasize their differences by contrasting with one another, as do the neutrals white and black. White looks whiter when contrasted with black than with cream, of which white is a constituent. There is no white in black. Conceptual reality is a construct of the mind, and many of us escape from our tangible reality by entering our conceptual reality, which to us is sometimes more real than the tangible. Conceptual reality exists entirely in the mind. It has no bearing or dependence on actual or material objects, space or time. An in-law of mine is coming to terms with the fact that she has had her leg amputated. She cannot believe it has happened to her, and yet she can see the evidence. She has lost her leg. On her part she has to adjust her mind to acknowledging that she will have to live the rest of her life without her right leg. 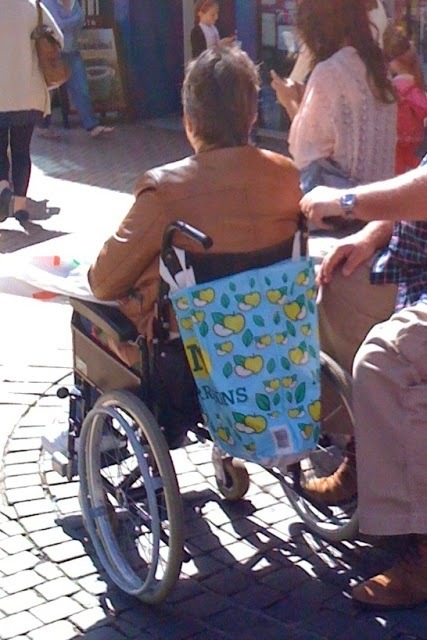 She will have to learn how to move about on a wheelchair, or on crutches, and, perhaps in time, with the help of a prosthetic leg. If she cannot adjust to her new physical reality she may retreat into a conceptual reality where she happily abides, while others attend to her physical needs. Understandably, the world is unsympathetic to people who do not live within the norm of general or shared reality where one is expected to cope, earn a living and pay taxes. 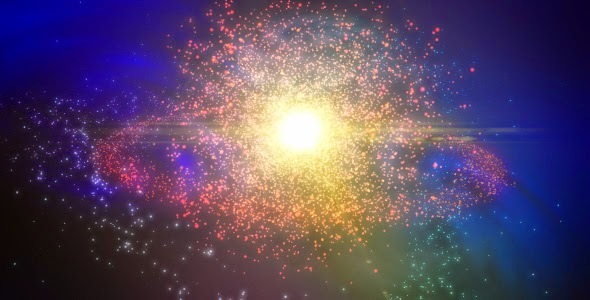 The irony is that the world is comprised of many people, any of whom may find they are suddenly and unexpectedly placed in a position of dependency where their new reality deserves compassion and care. *Concise Oxford English Dictionary definition of reality. 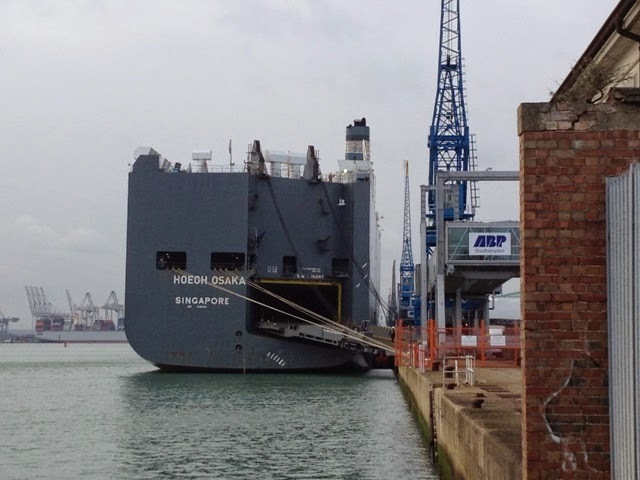 While at Southampton on Thursday, 5th February, 2015, I took these photographs of the Japanese car carrier ‘Hoegh Osaka’. 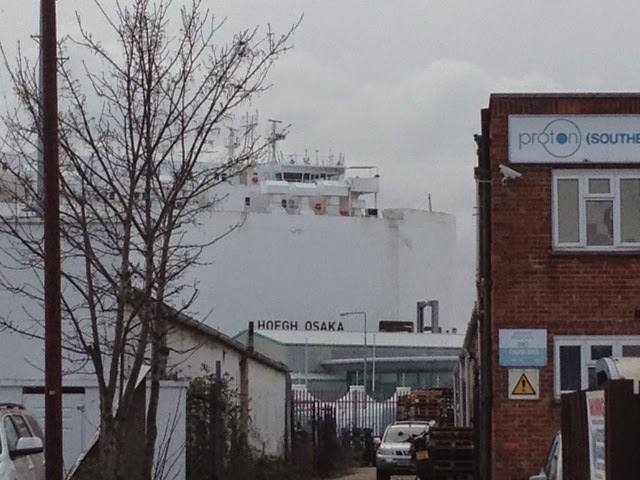 She was in the news on 3rd January when she was deliberately run aground on the Bramble Bank. For reasons yet to be fully explored by the Marine Accident Investigations Branch, she developed a severe list to starboard. It would seem that the master of the ship and the pilot jointly decided to run the vessel aground to prevent her from listing further. Because of the hazardous situation, 25 crew members were taken off the ship by helicopter and RNLI rescue craft. She was carrying a precious cargo of more than 1,400 cars; Jaguar Land Rovers, Hyundai and Minis. 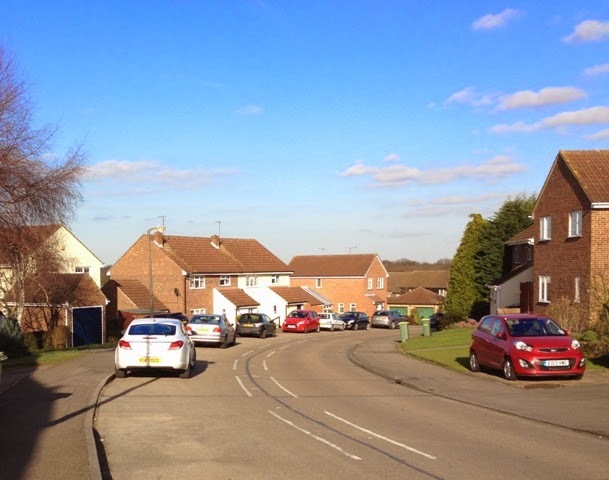 There were also a number of JCB vehicles. 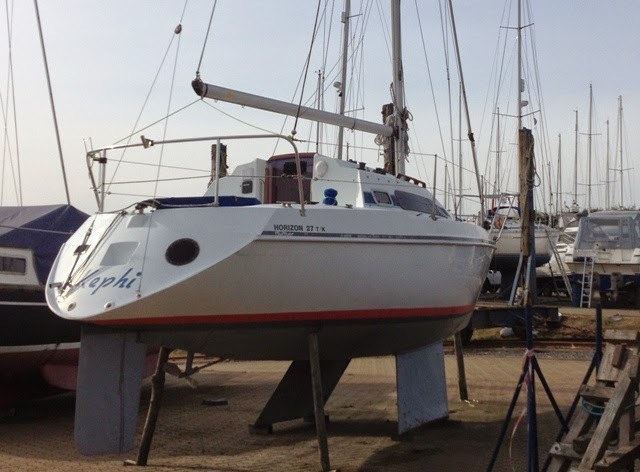 After being stranded on the Brambles Bank for 4 days she unexpectedly re-floated, and she was taken to the Alpha Anchorage between East Cowes and Lee-on-Solent. 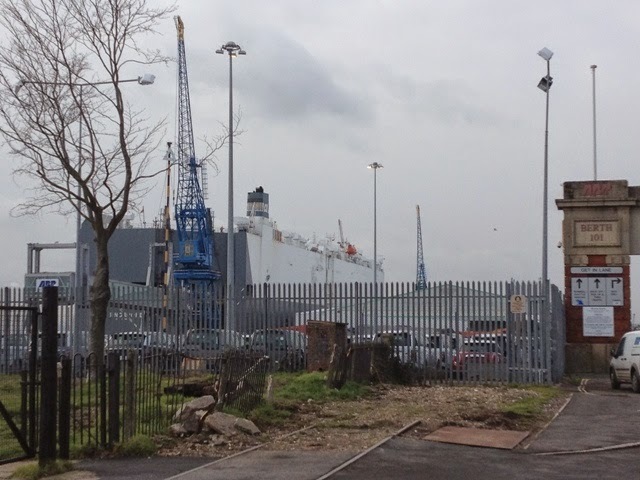 From there she was moved to Berth 101 at Southampton Docks. When I saw her she was fully righted, and beside her in the dockside compound there were many cars. She is shortly to set sail for Falmouth under her own power where she will remain for two or three weeks for undergoing repairs to steel works and hydraulics. 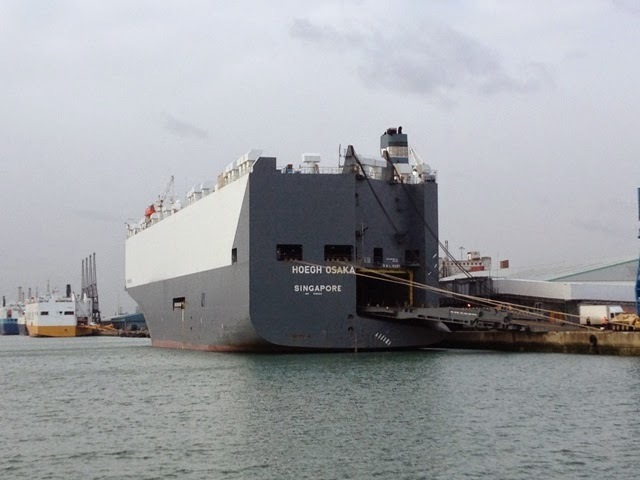 She is scheduled to return to Southampton for taking on the original cargo, apart from damaged vehicles. She will then set sail for Bremerhaven in Germany, which was the intended destination before the incident. 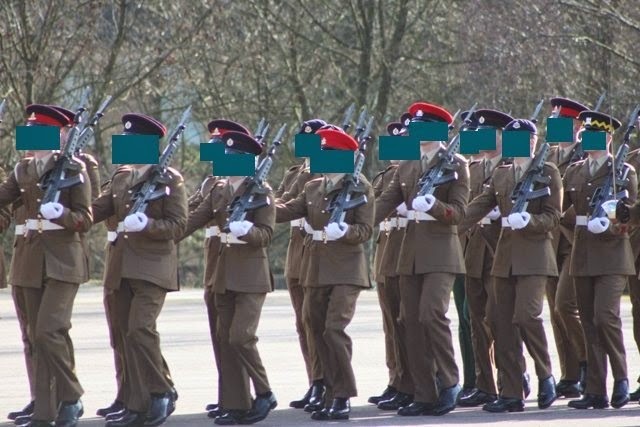 I recently attended a passing out parade for soldiers at the Army Training Regiment, Winchester, and I was mindful that these young men and women had committed themselves to serving citizens of the UK. A booklet issued to visitors to the parade had a page devoted to explaining the ethos and core values underpinning service in the Army. I’m unsure of what the words mean. Is the ‘mutual trust’ between soldiers or between soldiers and the ones they serve? - Probably the latter. Morale in a fighting force can be diminished by lack of support from the general public, and a soldier’s will to fight will be greater when he believes he is fighting for a just cause. I would expect a military force of a democracy such as ours in the UK to instil these values into all personnel. 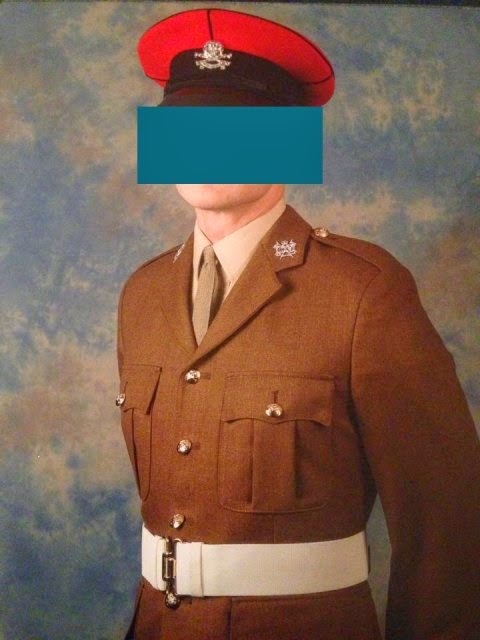 I have the highest respect for members of the British armed forces, because they pledge themselves to the service of British citizens, and they are prepared to lay down their lives for us. It was a privilege to watch my grandson, along with his comrades, as they passed out that day. Debates have taken place in the House of Commons over the controversial issue of ‘three-parent babies’. An overwhelming majority of MPs voted in favour of mitochondrial transfer, in which defective DNA in a woman’s egg is replaced with DNA from a healthy donor’s egg. A malfunctioning egg has a nucleus that is surrounded by defective mitochondria. 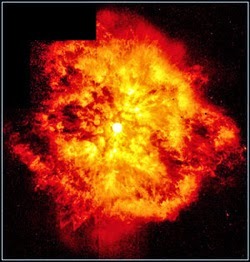 A child born with its effects will suffer badly, and perhaps die within hours. If he lives, he will not function as a normal child, and he will have severe impairments so as to require constant care. 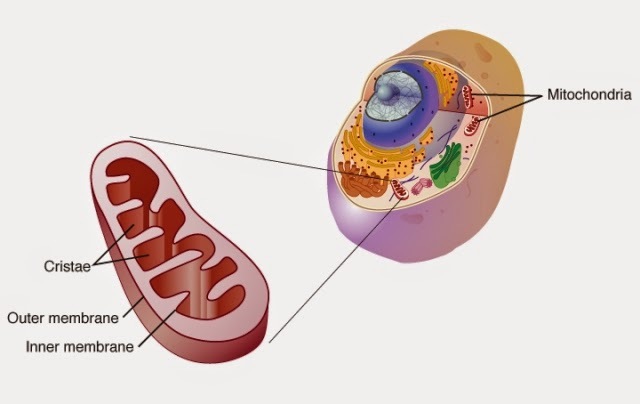 This dire situation can be eliminated if the nucleus from a defective egg is surgically removed, and made to replace the nucleus of an egg with healthy mitochondria. The genetically modified egg then has potential for growth into a healthy embryo after being fertilized by the sperm of a father and inserted into the womb of the mother, who otherwise could not give birth to a disease-free child. Pioneers of this form of IVF believe that such women will give birth to perfectly normal and healthy children. They will inherit only a few genes of the chromosomes of the nucleus of a donor’s egg, i.e., 32 out of 22,000. These exchanged genes will be transferred to subsequent generations. The procedure involves two women and one man. Hence the term ‘three-parent child’. Imagine you were born with this deadly disease through inheriting it. Metaphorically, your condition can be compared to sin inherited through lineage stretching back to Adam that brings certain death, but God in his mercy, through His surgeon the Holy Spirit, places you into Christ. Within the perfection of Christ you have no defect. That is how God sees you. He sees you as He sees His Son, with whom He is well pleased. 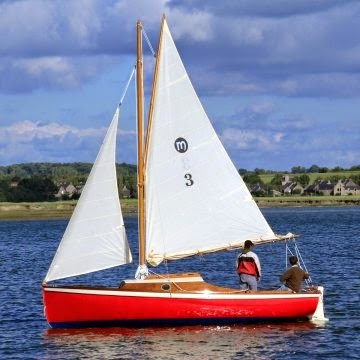 Here’s a ‘For Sale’ page* at ‘Port-na-Storm’ featuring a beautiful Andrew Wolstenholm Coot that was built by Graham Neil from a Jordan Boats plank kit supplied by Alec Jordan. The article is illustrated with lovely photos, a couple of which I have taken the liberty of reproducing here. 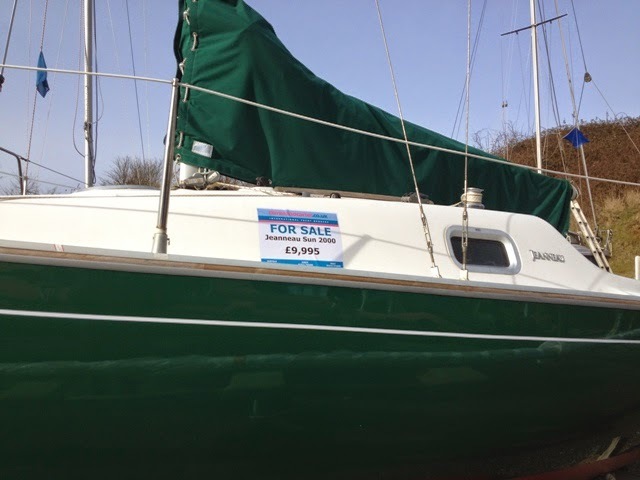 I’m assuming the dinghy is still for sale. 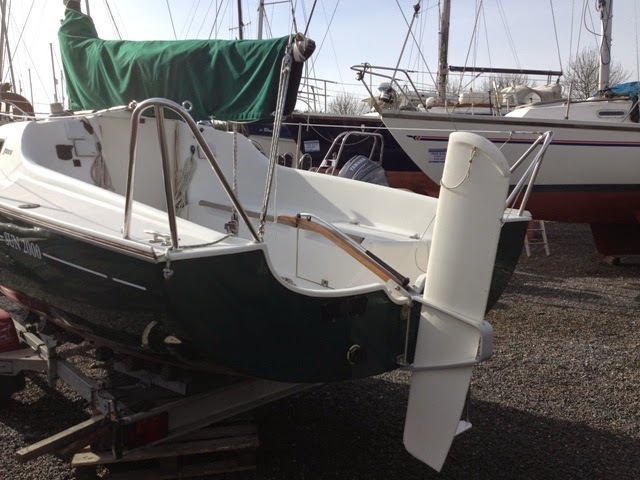 This boat was a Watercraft Amateur Award Winner at the 2011 Beale Park Boat Show. She’s featured in Watercraft Magazine No. 88 – 89. Until today, the aft deck of ‘Minnow’ resembled a cobweb, because I had tied together a number of ropes converging to a specific point above the deck for retaining one of the sheet blocks. 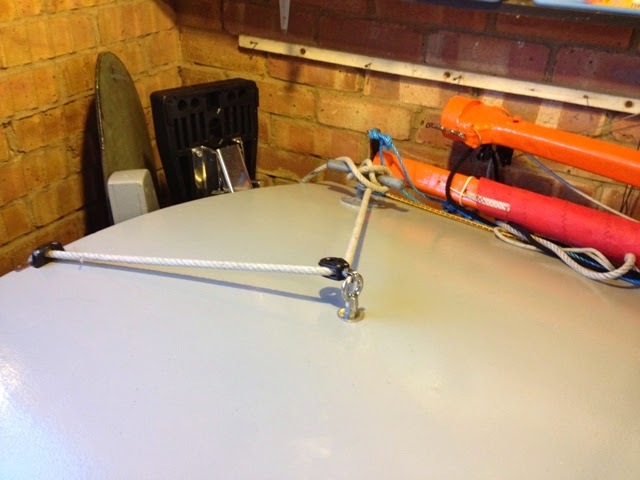 This afternoon I replaced the tangle of ropes with a single stainless steel eye bolt. 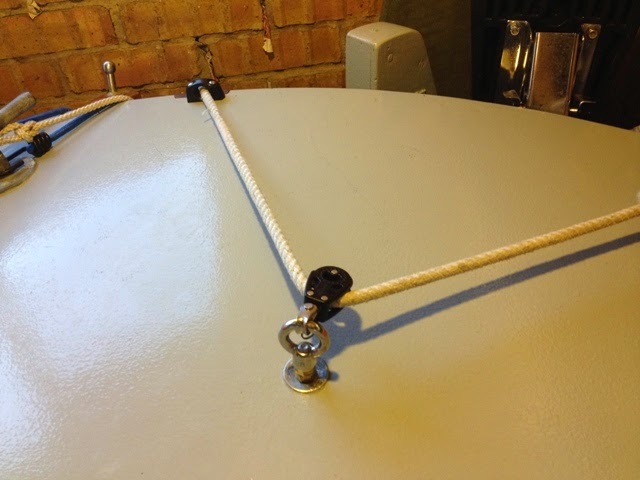 The ropes are no longer a hazard, and since they have been eliminated there is room for the helmsman to sit unimpeded on the deck, from where he can steer the boat with the tiller extension. Hopefully, the eye bolt will be as effective at securing the block in the optimum position for keeping the sheet clear of the outboard. It certainly looks a lot smarter, and it will be maintenance free. 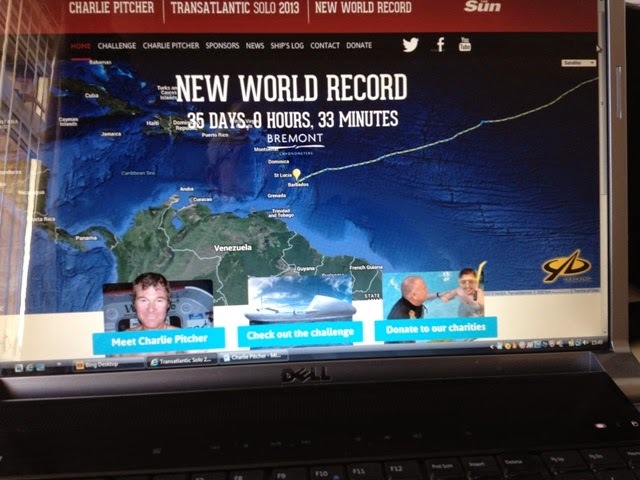 Charlie Pitcher is in training again for a solo marathon row, this time instead of rowing the Atlantic in a record time of 35 days he plans to circumnavigate Great Britain non-stop. This has never been done. If he succeeds, he will have achieved a remarkable feat of endurance and seamanship. He intends setting off from London on 1st June this year. Whether he will head north up the east coast or south around the Kent coast will probably be determined by the long-range weather forecast. He will face many hazards, and I have no doubt that this will be his greatest challenge to date. My guess is, that apart from the long row on the tidal Thames and out to sea, he will be aiming to keep offshore at a distance of about 40 miles or more for most of the time. His greatest enemy will be exhaustion through lack of sleep and constant struggles with winds and tides. 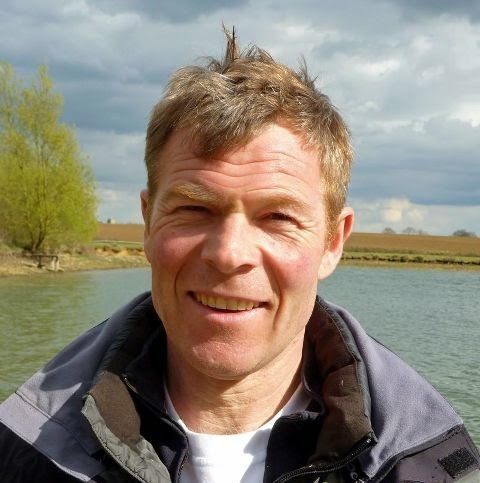 A tough and determined man that he is, I rate his chances of success at rowing non-stop around Great Britain, which I assume will include the Shetland Isles, the Outer Hebrides, Ireland, the Scilly Isles and the Isle of Wight, are fifty-fifty. A lesser man would not stand a chance. He is not a madman, but a very courageous and brave man who gets a kick from testing himself to the limit of his endurance. 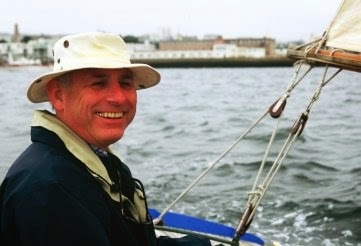 Solo Sailor of the Smallest Boat Around Britain?